The BAKFlip® Tonneau Cover is the NEWEST GENERATION of hard, folding multi-panel tonneau covers! Enjoy all the security of a locking hard tonneau cover and have instant access to your entire truck bed! The innovative BAKFlip cover folds all the way forward and up against the truck's rear cab (rear window) giving you access to all of your truck bed without removing the cover! However, the BAKFlip is also easily removable with 2 wing nuts and weighs only 40 lbs! PLUS - The BAKFlip DOES NOT INTERFERE with stakehole pockets on your truck, so it works perfectly with side rails, heachache racks, tie downs, overhead truck racks, etc! 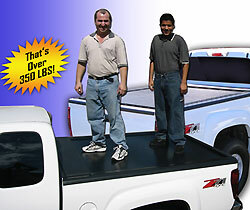 See full details on the BAKFlip Tonneau Cover. The Rollbak® Tonneau Cover is a 100% Powder Coated Aluminum Hard, Retractable, tonneau cover that gives you instant access to your truck bed and cargo without ever removing the cover. Better yet, this cover does not interfere with stake hole pockets, so you can keep those tubular bed rails without having to remove them. You can even use this cover with your existing ladder rack and your tie downs. This cover is level with the truck bed, so you maintain your truck's original sleek profile. See the full details on the RollBak Tonneau Cover.